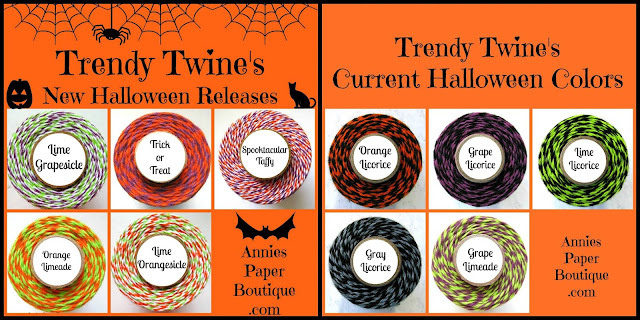 Today we have a special post showcasing Trendy Twine's new Halloween colors and this adorable twine box and twine wrap card that Ann from SVG Cutting Files created. Aren't they so cute, perfect for storing your spools and minis. There's also a broom box an the twine wrap card comes in a set of three. I used Orange Limeade on the pumpkin wrap and Trick or Treat for the box. The cute little kitty is also from SVG Cutting Files. Hop on over to the Trendy Twine blog and check out Jessica, Jamie and Kate's adorable boxes and twine wraps too! There's some really nice Halloween Packaging Kits at the store with some boxes, bags, tags, Halloween tape and a stamp, perfect for your treat projects. Here's all the Halloween colors available, five new join the five current ones, love them all! Super Cute... love the paper choices you used!! This is super CUTE and I just love that little Kitty. Beautiful projects, the kitty looks awesome too! Your papers coordinate perfectly with the twine! this is sooooo cute!!! love that kitty!!! So cute! 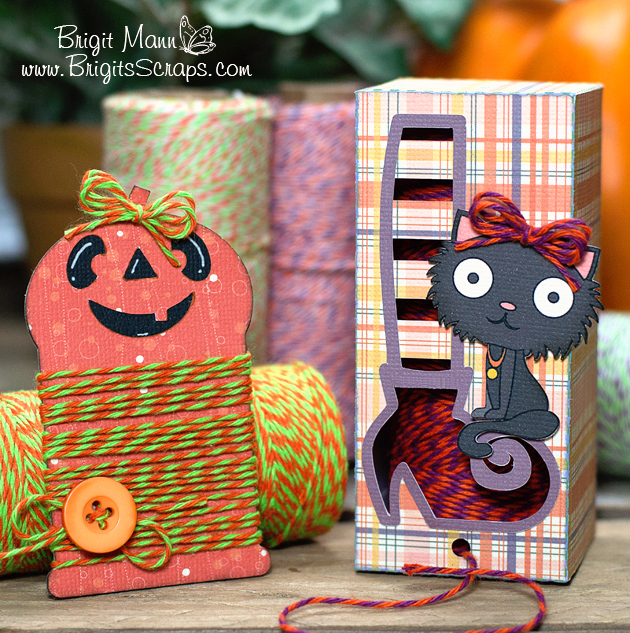 Love the twine colors and projects. OMGosh these are too cute!! Love the twine colors too!! This is awesome Brigit! LOVE the papers and that adorable kitty!!! As always super fab project! !